As an adult Scout advisor at Scout Camp, part of my responsibilities were to make sure the boys in my troop made it to their merit badge classes. Even "trustworthy" Boy Scouts are strongly tempted to ditch a a boring lecture when all kinds of outdoor adventures await them. Once they were securely in their classes, I'd have some free time to wander the camp looking for birds. Near the Eco-Con learning area, where Boy Scouts learn about and earn such "boring" merit badges as forestry, environmental science, and geology, I found four Cordilleran Flycatchers; two I believe were adults while the other two were recently fledged juveniles. The adults were actively capturing insects off the plants in the area and returning to feed the fledged young or they were taking their bounty to the nest box shown here. Funny thing was that they were not using the house part of the nest box, rather the base; entering through the small gaps. With all that activity, and never having been able to observe Cordilleran Flycatchers with such ease, I plopped myself down on a flattish rock and took a couple hundred photos of them. As a beginning birder in Arizona, I'd often see these small yellow-green flycatchers. 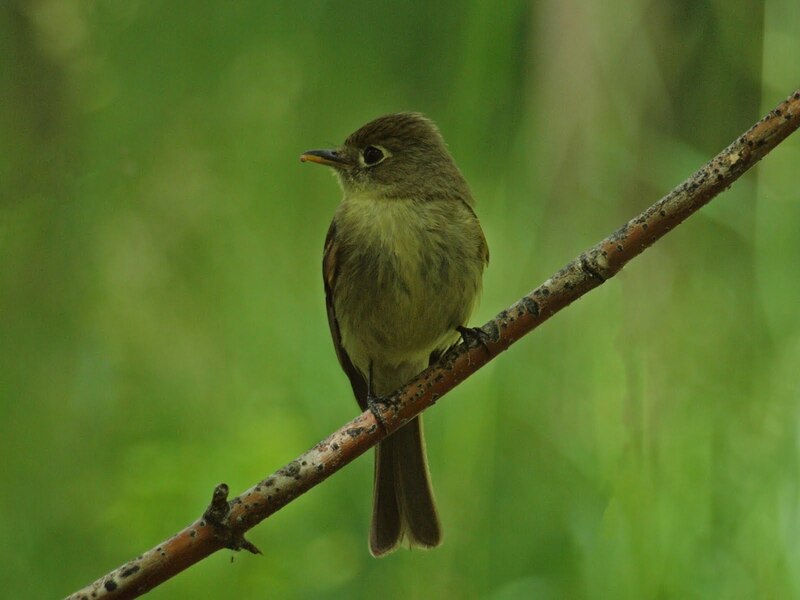 Those people I went birding with there explained that in Arizona it is often hard to know if the bird is a Pacific-slope or Cordilleran Flycatcher as they are virtually identical in appearance. My records for Arizona all simply note "Western Flycatcher". But here in Utah, the odds greatly favor the range of the Cordilleran. Unless you've been birding in the intermountain west, this is likely a bird most birders are not familiar with, so am particularly happy to share it! 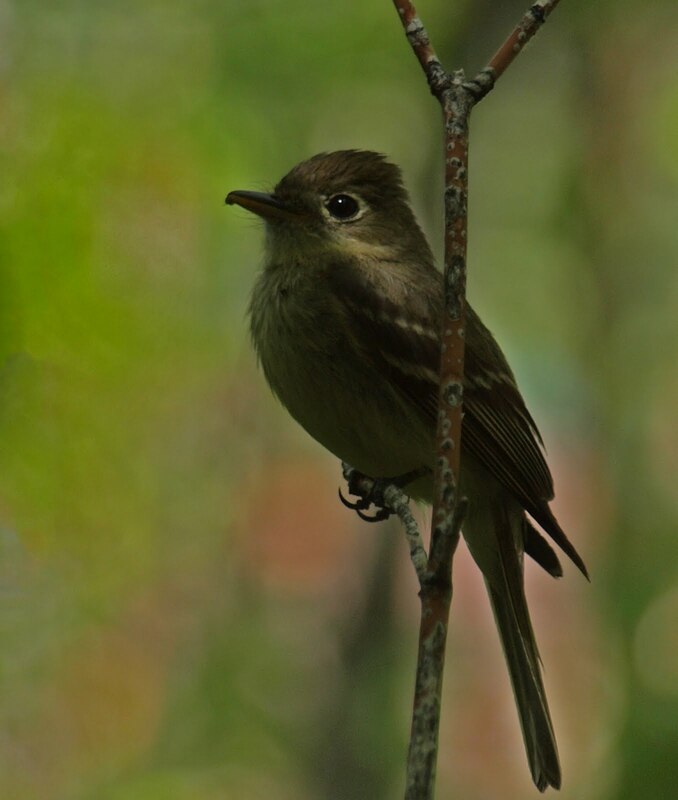 It appears that the Cordilleran Flycatcher winters in the southern half of Mexico. By April you can see them migrating into the American Southwest. In May we see them extend their range all the way into the southern portions of British Columbia and Alberta. In September, the southward migration is already apparent. I've had difficulty reaching a decision of the Western Flycatcher variants in AZ as well. What altitude would you estimate you saw these Cordillerans at? The pro Pacific-Slope crowd say the Cordillerans prefer higher altitude and so wouldn't be found at the Desert Botanical Gardens in Phoenix, but that doesn't seem any more or less likely to me than the Pacific-Slopes leaving their beloved coast-line. Since I've seen the birds consistently every time I've been to the DBG, I think they're more residential that migratory as well.